We’re nearing boating season, and the occasional warm day is making us dream of being out on the water again! If you’re new to using a Bimini top to provide shade from the sun, you may be wondering how to best care for it so it stays looking good. Bimini tops made by reputable manufacturers are built to withstand everything Mother Nature throws at them: sun, rain, dust, and moisture. But just like the boat you rely on and expect to perform when you need it, your Bimini top will require regular care and maintenance. If metal parts aren’t washed and protected, they’ll rust over time. And even fabric that’s designed and treated for marine applications will attract dirt that serves as an ideal home for mildew and mold if it isn’t kept clean. Even the highest quality Bimini tops need to be regularly maintained and tended to. This guide will walk you through the steps to care for and preserve your Bimini top. If you give it the attention it deserves, you’ll enjoy your Bimini top for years to come. That sea breeze you find so refreshing can wreak havoc on the metal frame of your Bimini top. Salt can eat into the finish, causing corrosion which may eventually require that the frame be replaced. Each time you take out your boat, be sure to rinse the Bimini top thoroughly when you return. Periodically, you’ll need to give the top a more comprehensive cleaning. Most manufacturers recommend monthly washings. Use a cleaner that is specifically designed for boats so you don’t accidentally wear down the metal’s protective coating. Particularly avoid cleaners with chlorine or phosphorus ingredients and those in powder form since they’re harsh and can damage your frame. And always use a soft cloth to avoid scratches. After washing, rinsing, and drying your frame, it’s a good idea to use a polish that will provide a protective barrier and follow it with a fiberglass wax to keep rust at bay. Zippers and fasteners are so small that it’s easy to forget to add them to your maintenance list. But to prevent unsightly corrosion that can then spread to your Bimini’s fabric, you’ll need to make it a priority to care for them. You can treat both zippers and fasteners with a clear silicone spray to preserve them. This spray is odorless and highly water resistant, and it forms a protective barrier against rust and corrosion. You can also use this spray on other parts of your boat, including your engine bay. It’s safe for use on not only metal, but also on rubber, canvas, leather, nylon, and wood. After cleaning the bimini top, apply the spray to the zippers one at a time, moving the zipper back and forth to work the spray into all the nooks and crannies. Fasteners can simply be hit with a shot of spray. Cleaning is the secret to a bimini top that lasts and looks like new. Fabric, even when treated with protective coatings, can accumulate dirt that attracts mold and mildew if not cared for. Your first line of defense, as we mentioned when discussing caring for the metal components, is rinsing your Bimini top after each excursion. You may need to use a soft brush to remove dirt or debris. Then do a thorough cleaning on a monthly basis. If your top is made by a respected manufacturer, frequent washing won’t fade the color. However, be sure to check with your manufacturer for any specific care instructions. 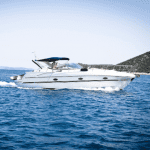 Most bimini top owners can adopt the following fabric care routine for monthly washings. Prepare a solution of warm water and liquid dishwashing soap. Be sure not to use detergents or harsh chemicals, since doing this may void your warranty. Using a sponge or a soft brush, gently scrub the fabric. Rinse immediately with clean water. Allow the fabric to air dry thoroughly — don’t use a machine dryer or dry clean. If you encounter a stubborn stain, you may want to try a fabric cleaner specifically designed for marine applications. Regular cleaning will wear down the water-repellent coating on your Bimini top fabric over time. This is normal. You’ll want to periodically apply a fabric guard to restore the coating. This step is important because the coating is what makes water run off of the top instead of soaking into the fabric. Despite your best efforts, mold or mildew may invade your Bimini top. A little bit of moisture left in a folded-up top or dirt that’s been allowed to camp out too long creates an ideal environment for this notorious fungus. If you notice mold or mildew, be sure to treat it right away. What starts small can quickly become a large issue, requiring more time and work to remediate. Black mildew particularly can cause stains that are extremely difficult to remove if allowed to sit for long periods of time. First, start with your standard monthly cleaning process. If stains persist, use a mold-specific cleaner, like Iosso Mold and Mildew Stain Remover, that’s safe for marine fabrics. Iosso’s cleaner comes in a powder form that you’ll mix with water to form a sprayable or spreadable solution. Wet down your fabric, then apply the solution and scrub with a soft brush. Allow the solution to sit for about fifteen minutes, then scrub the fabric again. Finally, rinse with clean water. If the specialized cleaner doesn’t do the trick, you may want to try a bleach solution — IF your Bimini top is rated for bleach. Many fabrics are designed to stand up to bleach, but you’ll want to follow your manufacturer’s instructions and test a small area before moving on to the entire affected surface area. Also note that threads, zippers, and fasteners can be damaged by bleach if they aren’t rated for it, so again, be cautious and check with your manufacturer before trying bleach. Always dilute the bleach with water, according to your manufacturer’s instructions. If your Bimini top has collected a significant amount of mold over a long period of time in storage, we recommend that you wear a mask to prevent the spores from entering your respiratory system. Spores can irritate your throat and eyes, causing coughing and eye watering. For those with a mold allergy, symptoms can be more severe, since the immune system overreacts and can trigger shortness of breath and chest tightness in addition to the common reactions of those who don’t have an allergy. Wind can bend your Bimini top frame and loosen fasteners from the fabric. If there’s no wind, you should be able to take your boat up to 45 mph with the Bimini top deployed. But if there’s a breeze of any sort, take the wind speed into account and adjust your boat speed accordingly. On particularly windy days, you may need to simply store your Bimini top and use the boat without it if you want to enjoy a faster boat ride. Wind on the highway while trailering will affect the Bimini top just like the wind on the water. In fact, because highway speeds generate excessive wind, you shouldn’t travel with the Bimini top deployed. You’ll want to fold the top and place it in your storage boot. If you don’t have a storage boot, simply bungee it down with a pad in between the boat and the folded top to prevent scratches. Always clean dirt and sand from the tracks before folding your Bimini top to avoid damage. 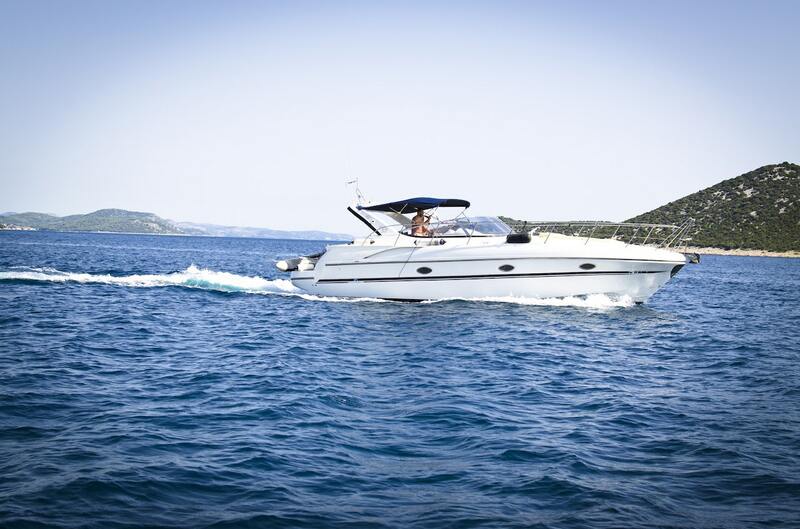 When you arrive home, give your Bimini top a thorough rinse and allow to fully dry. Once the top is completely dry, you can fold it down for storage until your next adventure. That much-anticipated free weekend has arrived, and you’re ready to take your boat out! Now is the time that makes all the effort you put into maintaining your Bimini top worth it. Setup should be easy after proper maintenance and storage. Unfold the Bimini top and attach the snap hook to the eye straps in the front and rear. Tighten the straps. If you have a rear brace kit, make sure it’s fastened to the deck hinges. Check that the screws and fittings are secure, and tighten anything that’s loose. Also double check that your hold down straps are as tight as possible. Keeping everything tight and secure will prevent wind damage. Regular maintenance is your ticket to enjoying your Bimini top as much as possible, for as long as possible. By following the steps in this guide, you’ll be able to focus your attention on the breeze and the waves, rather than on a malfunctioning or sad-looking Bimini top!